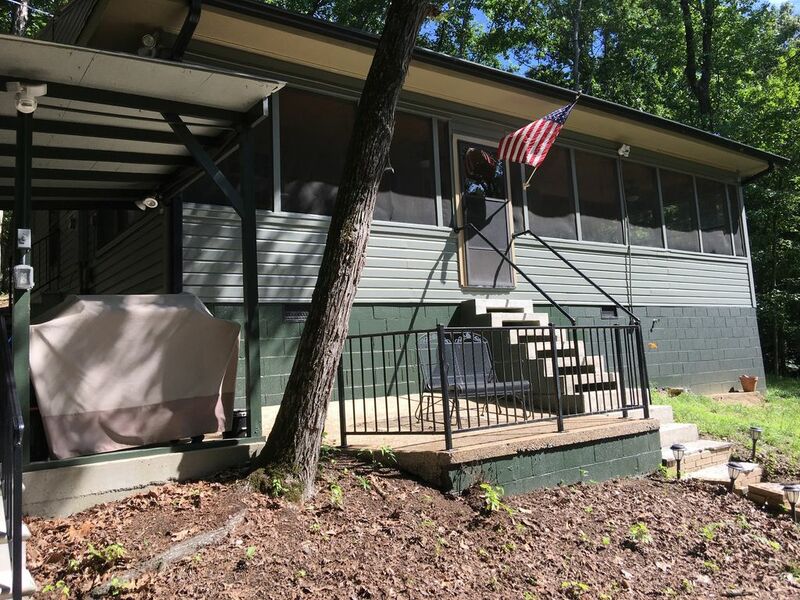 Available year round, 2 bedrooms and 2 bathrooms, NEW CENTRAL HEATING AND AIR, screen porch with rocking chairs with lake views, patio with charcoal grill, 47" TV, washer/dryer, dishwasher, microwave oven, coffee maker, gas log fireplace. PUBLIC BOAT LAUNCHING FACILITIES ARE LESS THAN 200 YARDS FROM THE CABIN. NO SMOKING INSIDE OF CABIN. Boathouse with new pier and covered deck with table and chairs to enjoy relaxing or fishing right on the water. Rental includes your own private pier for your use. (Boat slips inside boat house are not available for use at this time). Many outside electrical outlets available for charging your boat. A true escape from everything, Mockingbird Hill cabin is located on the shore of the Tennessee River, just outside Scottsboro, Alabama. While just minutes away from shopping and restaurants, Mockingbird Hill cabin offers hunting, fishing, boating, and relaxing in secluded peace and privacy. Fully furnished down to the towels, dishes, pots and pans. The fully furnished kitchen includes all NEW appliances including a dishwasher. We have a large lake lot and a huge screened porch for relaxing and watching the sunset. Public boat launching facilities are less than 200 yards from the cabin. For supplies and groceries Wal-Mart is approximately 5 minutes away and a country store with bait is located at the nearby Marina. If cooking is not your thing we have some award winning restaurants in this area. Take a scenic boat ride downstream for fine dining in a relaxed atmosphere with live music in the Goose Pond area or go upstream on the lake to some of the best BBQ in the south at Mud Creek. Fishing, swimming, skiing, golfing, shopping at Unclaimed Baggage, exploring Cathedral Caverns, spelunking caves, and less than an hour to Huntsville Rocket and Space center or the Tennessee Aquarium in Chattanooga. Mockingbird Hill is privately owned and maintained. NO LARGE PARTIES OR GATHERINGS INSIDE OR OUTSIDE OUR CABIN/PROPERTY. PUBLIC BOAT LAUNCHING FACILITIES ARE LESS THAN 200 YARDS FROM THE CABIN. NEW CENTRAL HEATING AND AIR. I have lived and worked in Jackson County Alabama all of my life. Bought this property because it sits next to our house and started out as an investment and elbow room but over the years have remodeled and made a vacation rental and guest house. Just perfect opportunity to obtain property and make my lifelong dream of owning property on Guntersville Lake come true. We love making improvements to the cabin and love just sitting on the front porch and watching the lake and beautiful sunsets. What a view ! Want everyone to enjoy this little piece of paradise that we call Mockingbird Hill. Property is treated to keep you and your family mosquito free. Large screened in porch with rocking chairs, ceiling fans and dining table. Perfect lake cabin for a two couple trip or for two fishermen. Perfect setup with all that you will need. It is really nice having a dock so you can come back for lunch. We put the boat in on day one and didn’t take it out until we left for home. Nice place with nice owners who will make sure it is clean and ready for your stay. This is an awesome little cabin. The owners are very nice folks who make sure you have everything you need to enjoy your stay. Cabin is fully stocked with everything imaginable. We loved being able to fish off our own private dock and relax on the large screened porch. It was so peaceful. I highly recommended 50 Taters restaurant. The food was so good. We had a great time and will definitely be back. Always a pleasure to stay here. Joan and Mitch great people very friendly. Nice and cozy place very clean have everything you need. My buddy backed out to come fish with me so my wife came down. She stayed at the cabin and relaxed or sat on the dock and done homework on her laptop. Mitch met me as soon as I pulled in. He showed us around the property and was very professional and polite. The cabin has everything you need. All you need to bring is food! The owners live next door to the property. I never seen or heard from them unless I needed something. I did need to know where the light switch was for the boat house, but I called and they got me taken care of. Ill def book here first if it is available for my future trips to Guntersville.